We have bin designs and lifting systems suitable for all waste disposal tasks, including the removal of both industrial and domestic waste. 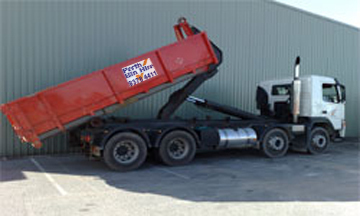 There are two varieties of skips that we offer, which include the hook lift and the lift on. 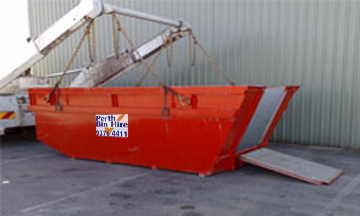 The lift-on skip bins range in size from the compact 2 cubic metre mini-skip to the large and versatile 10 cubic metre size. The verge-friendly lift-on bins are a favourite with domestic/residential customers, but the lift-on configuration has also made them popular with our industrial/commercial clients. These bins have a ramp for easy wheelbarrow access. Really almost anything that is not hazardous, and what’s more you can have just one type of material in the bin or 10 or more different types of material. The Hook Lift system provides a convenient, cost-effective compact waste management system for commercial/industrial organisations, but is also available for domestic/residential customers who don’t lack space, have a large waste burden and want a skip bin size that will allow them to dispose of it in a single load. These bins have large rear doors for easy access. *No sand, concrete, bricks or tiles or hazardous waste can go in the 15cbm, 20cbm and 30cbm bins due to safety and weight restrictions.